It has been some time since we last spoke, hope you are enjoying your summer holidays overseas – we are freezing here in Cape Town! While you have been basking in the sun I have been busy as a bee and this week I am pleased to share with you a few new items in the shop. 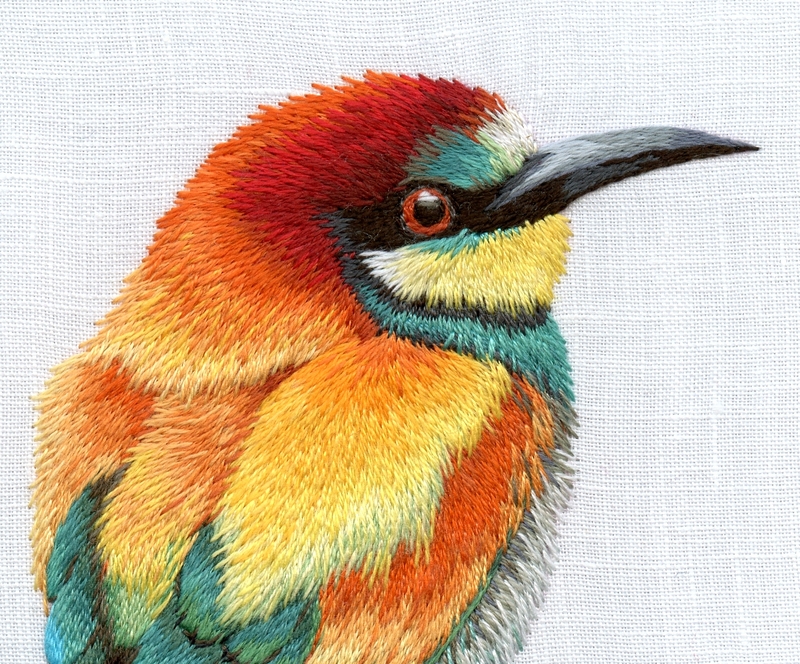 In response to numerous requests for more bird projects we have the European Bee eater kit, there is also a new lesson kit in whitework and an update on the white cotton project bags. European Bee Eater Bird. It is always difficult choosing a bird project – I get so many emails from different parts of the world requesting a preference for a bird in their country of origin, but there are certain aspects that I look for when stitching a bird: Firstly it needs to be beautiful and worth spending the time on, it needs to be a good form or composition and there has to be a certain something in the colours and shading that appeals. I also tend to like birds that have a kind eye, some of them look so angry! I am sure you will agree that the European bee eater ticks all the boxes? 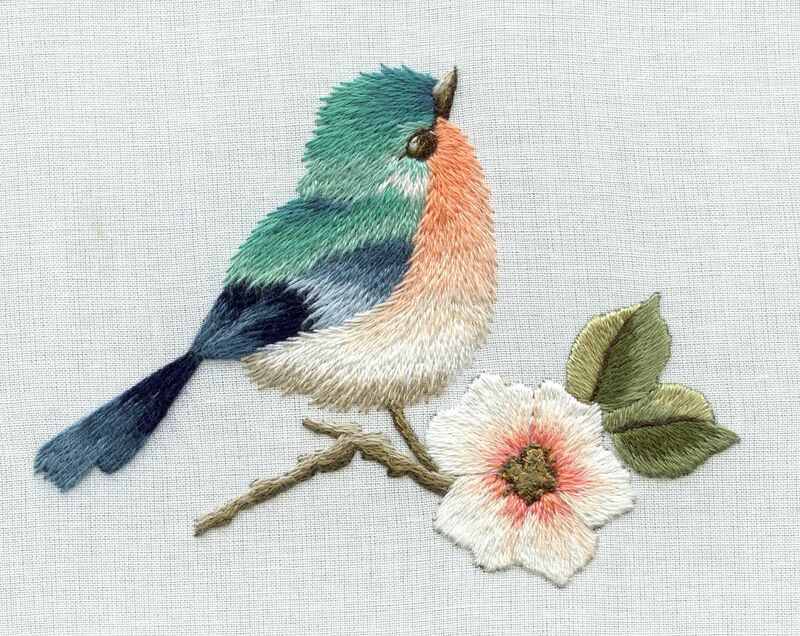 The colours are awesome and it really was a joy to stitch. You can find it in the Etsy shop here. Little cup of flowers lesson. The lesson in Whitework with colour allows you to learn the technique from the comfort of your home and to work at your own pace. 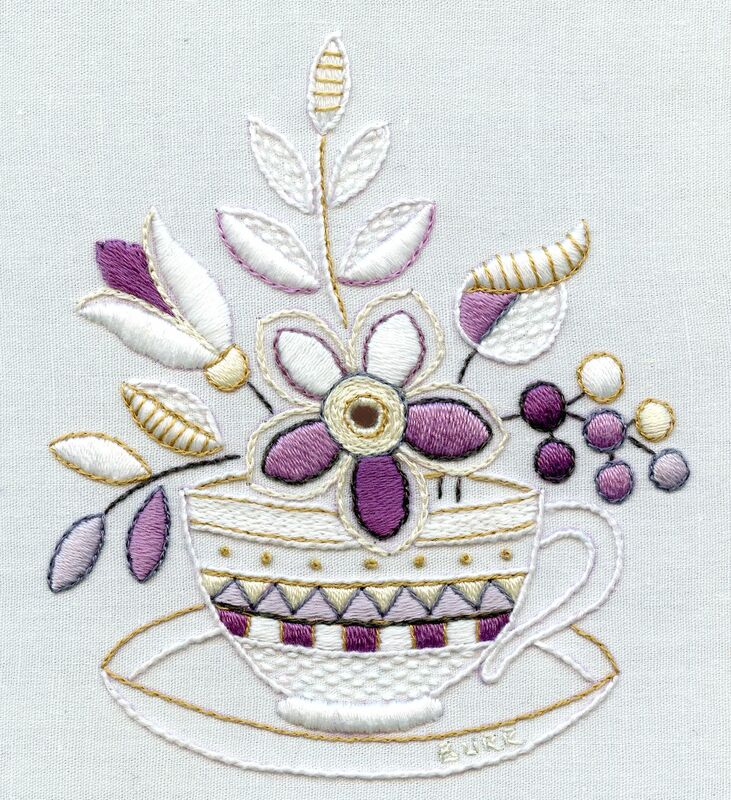 The little cup of flowers lesson in sumptuous shades of plum, gold and cream will teach you all the basics and includes everything you need to stitch the project. The design is simple, but has enough detail to keep it interesting. You can find the kit in the Etsy shop here. There are now two lessons available one for Whitework with colour and another for needlepainting that will allow you to either learn the technique or brush up on your existing skills. They both include fabric with printed outline, needles, instruction booklets and pre-sorted threads, so all you need is to provide a hoop. You can find these kits in the section FULL KITS. As you know over the last few months I have been re-vamping the kit instructions to achieve a simpler format which includes a cleaner interface with more pictures and less text. As a result it is easier to follow without having to turn back the pages whilst stitching. 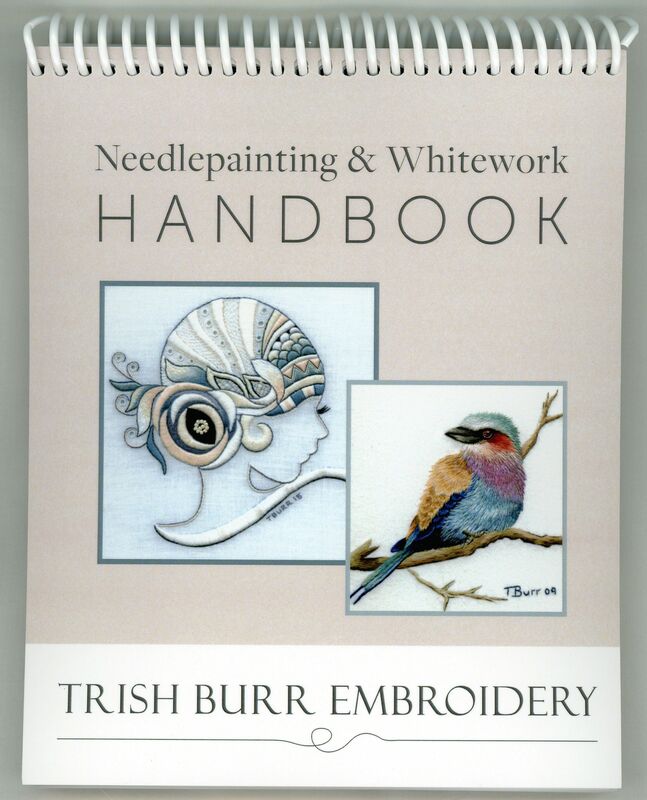 We have removed a few pages of stitch instructions and instead compiled these into one handy notebook – THE NEEDLEPAINTING & WHITEWORK HANDBOOK. The kit instructions include a basic stitch glossary but you will require a copy of the handbook for detailed instruction. Once you have a copy you can refer to it for any of my current or future projects. The good news is that as a result of minimizing the instructions the printing costs have been reduced and so we have been able to lower the price of each kit slightly. The initial copies of the handbook sold out within a few days but I have received new stock which you can find in the Etsy shop here. The initial response to these little bags was amazing, I had no idea they would be so popular and we were sold out very quickly – you can read about them in a previous post here: COTTON PROJECT BAGS. Some of you emailed me and suggested that the printed outline might be stitched and this got me thinking…………. I was concerned that it might be difficult to stitch as you would have to get your hands inside of the bag and it would get in the way but I found a way and it worked beautifully! 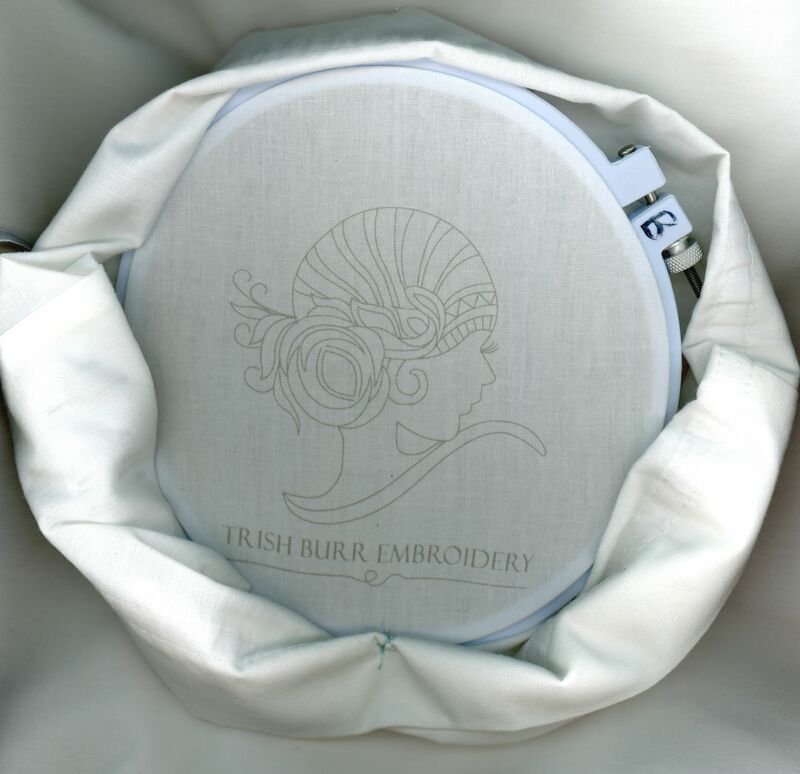 All you need to do is mount the picture area into a small hoop and fold back the excess fabric as shown below – then tack it into place whilst stitching. I then stitched the design in simple outline and filling stitches and this opened up a whole new idea for using these bags – they could be stitched as a gift for friends or family, or you could make it up into a little kit by adding a few skeins of thread – something different for birthdays or Christmas. 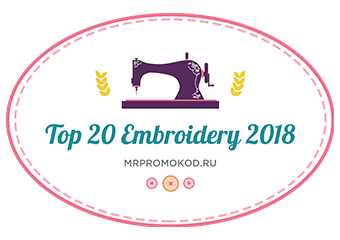 The bag itself has multiple uses: project bag for embroidery, quilting or sewing, lingerie/shoe bag for travel or a storage bag for stationary/other to name a few. The bag is now available in two different prints: Gatsby and Cup Of Flowers. With the bag you will receive a project card with a picture of the finished stitching and some suggested thread colours and stitches to use – the great thing about it is that you can use up threads that you have in your stash, use any stitches you like and have fun with it. The bags can be found in the Etsy shop here. If you have previously ordered the cotton bags and would like a PDF copy of the project card please email me through the contact form on the website. Hope you like the new additions, have a wonderful week and till next time keep smiling and happy stitching. 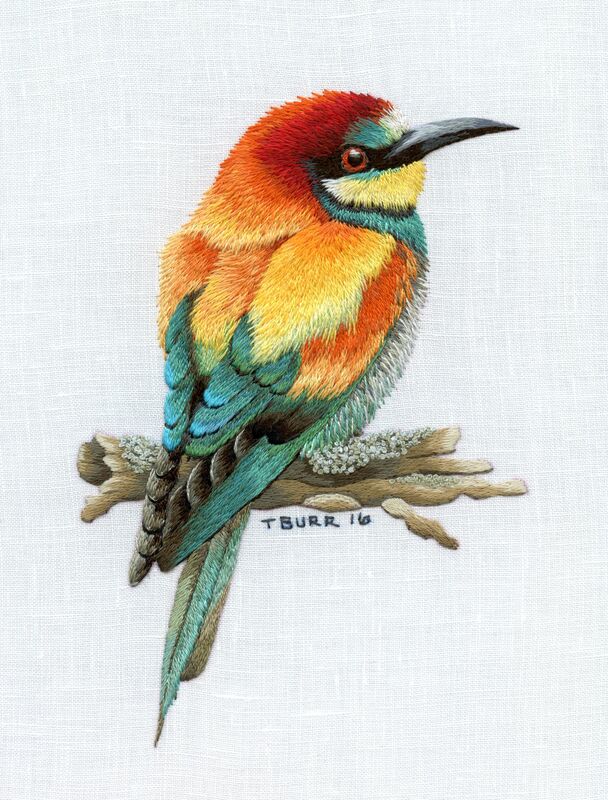 Was blown away by your latest bee eater; but when I went to Etsy to order it and the booklet, they were not available. So sad. Utterly beautiful … bird looks so real. You are such a gifted lady.